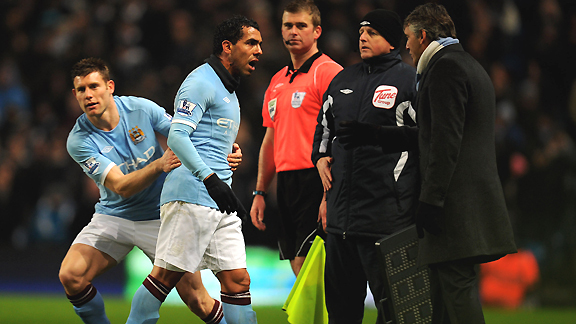 Tevez has regularly threatened to quit English football, claiming he has lost his love of the game. The former Manchester United man’s mood has not been helped by the fact he lives away from his two daughters, who are in Argentina. Relations with manager Roberto Mancini have grown increasingly strained during the course of the season, and it recently spilled into the public arena as Tevez launched a verbal volley at his boss when substituted during the 1-0 win over Bolton. A statement on City’s official website read: “It is with disappointment that we confirm to our supporters that Carlos Tevez has submitted a written transfer request. The club can also confirm that the request has been rejected. City clearly have not given hope of persuading their skipper into a Wayne Rooney-like U-turn, revealing that the 26-year-old is keen to sign a new contract. The Eastlands outfit appeared to hint that Tevez’s transfer request is inspired by his advisors. “The written transfer request is in stark contrast to Carlos’ stated position in both public and club contexts,” the statement continued. “Significantly, over recent months, the club has also received numerous requests from Carlos’ representative to renegotiate and improve his playing contract as well as more recently a request to extend that contract by another year. “However, in line with the club’s policy of not negotiating playing contracts mid-season this has not been granted. Carlos’ current five-year contract has three-and-a-half years to run and he is the highest paid player at the Manchester City Football Club. With Tevez known to desperately miss his two daughters who are back home in Argentina, returning to South America is one option, as is retirement. City have tempted Tevez with the offer of a £100,000-per-week pay rise – which would take him up to £250,000-per-week – but the striker is reportedly so fed up at Eastland’s he never even considered the deal, and is in fact considering taking a pay-cut to ensure a transfer. Fan of sports. Like to play football, cricket, badminton etc. I can,t talk nicely like others. But a good listener. Like to have true friend. Carry on the good work dude!